There are probably an infinite number of rhythms you can use to strum a guitar. These are often called "strum patterns", or what I call "strum rhythms". I will show you in both notation and recorded examples, from simplest to more complex, several common strum patterns. The strum patterns below are all in common time. In other words, they will work with any music that has four beats per measure. The vast majority of music is written in this time signature, so these strum rhythms will work with lots of tunes. Before we get started, here's a quick explanation of the symbols. If you watch well-trained guitar players, their strumming hand is often continually churning up and down in a steady rhythm, even though they may not always actually hit the strings every time the pick goes up and down. If the strumming hand keeps a steady rhythm, avoiding the strings when necessary - using "air" strums - it is usually easier to keep a steady, driving rhythm and maintain the normal accent that occurs on downbeats (when our foot taps the floor). If you follow the directions for the following examples carefully, using "air" strums as noted, although it may feel awkward at first, in the long run you will develop a strong and rhythmical strumming motion that will enable you to do very complex rhythms. One more tip: When strumming down, strum only the strings that are used for the particular chord - for example, strum only the bottom five strings for a basic open position C chord. When strumming up, strum only the bottom two or three strings (the highest-pitched ones). This gives the music a better "rhythmic feel": The downbeats are louder and the upbeats are softer. This is how music normally sounds and helps propel it forward with a driving rhythm. For example, when strumming an open position D chord, only the bottom four strings are usually strummed, while the top two are avoided. Therefore, when strumming down, strum the bottom four strings, but strum only the bottom two or three (the highest-pitched ones) on upstrums. The following example demonstrates this concept. Play the sound file to hear it. 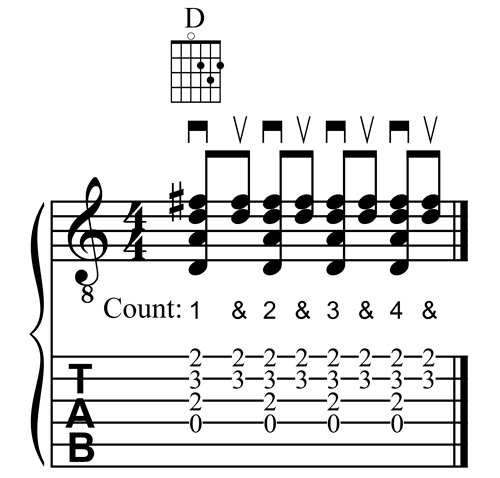 Click here to get a pdf version of all of the following strum rhythms. Please don't distribute this pdf by photocopying or posting it on the internet. You may print out one copy for your own use. If you know someone who wants a copy, simply refer them to this website. Please help me protect my intellectual property by respecting my rights. I hope that this page is helpful as you learn new and more complicated strum rhythms.